Central Florida is full of attractions and entertainment, with so much to see and do its easy to see why the area is the most visited vacation destination! From the Disney World theme parks to Universal, Busch Gardens to Gatorland you could spend weeks in the area and still not see everything there is to see! However one theme park sticks out above the rest, with a unique theme that surpasses the rest the Sea World theme park takes you to the most exotic places of the ocean to bring you long lasting experiences! Whether you are watching a four ton animal flip through the air or narrowly escaping the lost city of Atlantis this theme park has visitors coming back year after year! From comical sea lions to arctic adventures, Sea World is a must for anyone vacationing in the Central Florida. Sea world’s most alluring entertainment is its vast variety of shows and demonstrations. 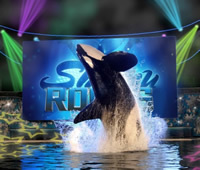 The most popular experience is Shamu Rocks, a wild adventure into the world of killer whales where these awesome animals work in unison with trainers to perform incredible stunts and maneuvers! Combined with awesome music and light shows this is an awesome show that you won’t want to miss! Next head on over to Clyde and Seamore Take Pirate Island where this comical pair marooned man and sea lion face off against a clumsy pirate that plans to search their island for treasure. Finally head on over to Blue Horizons for Sea Worlds newest show and enjoy a seamless and perfect display of acrobatics by dolphins and costumed characters! 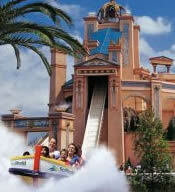 Sea World is also home to a wide variety of fun and exhilarating rides! Take a wild adventure through the Lost City of Atlantis where you will be greeted by a mermaid. Suddenly things turn for the worse and she has no intentions of letting you leave. Get ready for a narrow escape! Next head on over to the Kraken, a floorless roller coaster that reaches speeds of sixty five miles per hour! This roller coaster even plummets under ground before going into its final maneuver! Next head on over to the Manta, a new and unique roller coaster that has had roller coaster enthusiasts traveling from all over the world to ride it! This roller coaster lays you flat down facing the floor, that means the first drop is a head first dive into an inverted loop! With so much to see and do at Sea World it is a must for anyone visiting the Central Florida area! Enjoy wild shows and incredible rides, in fact we only mentioned a few of the many at the park! Best of all you can get in at a discounted price when you purchase your tickets through us! Our great Discounted Sea World Tickets are the perfect solution for your vacation! After all it’s always so much better when it’s more affordable! Make your trip to Sea World today at an affordable price when you purchase tickets through us!